Robert "Bob" de Hilster worked as an electrical engineer in research for over 40 years, specializing in the area of telecommunications in which he holds several patents. He worked on one of the first large commerical computers, the Remington-Rand Univac. He worked over twenty years for North Electric in Ohio developing digital switching systems. Robert then worked for another 20 years for Itec in Huntsville Alabama working again in the area of telecommunications. 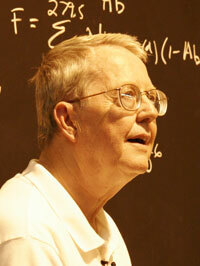 In 2006, Bob started work on a gravity experiment to try and detect gravity as a particle. Since then, he has developed his own equation for gravity that is based on a cloud of forces allow him to simulate any physical setup. De Hilster has also looked into his gravity equation explaining anomolies in orbits, planet rotation, dark matter, to name a few. Robert is one of the main characters in the documentary film Einstein Wrong - The Miracle Year coming out in late 2013. Robert is finishing a book on gravity called "Gravity is Not Free". Bob is married to Patricia de Hilster and has four children: David, Karan, Laurie, and Michael. He is retired and lives in Boca Raton Florida.